The Pointer or English Pointer is a sweet-natured and noble pointer dog recognised by The Kennel Club under the gundog family. Since it was bred to hunt and is highly energetic, it should belong to an active owner who can provide the time and energy. Other than its love for the outdoors, the English Pointer is an excellent companion and family pet because it is easy-going and calm. This gundog ranges from medium to large, weighing 45 to 75 pounds and standing 61 to 69 centimetres. Are you looking to buy an English Pointer? Before you decide, learn more about its background. The history of the English Pointer is highly debatable since different records point to different places of origin. According to one source, the Pointer dates back in England in the 1650s, while another source suggests that it descended from pointing breeds that include the Old Spanish Pointer and Portuguese Pointer, crediting Spain as the breed's actual country of origin. Other ancestors from which the Pointer is believed to be descended also include Greyhounds, Foxhounds, Bloodhounds and Bull Terriers. In the 16th century, Pointers were used to hunt together with a pack of Greyhounds. However, in the 17th century when wing shooting became popular, Pointers accompanied the hunters on their own, and that was when they were recognised for their excellent hunting skills at par with Irish Setters. 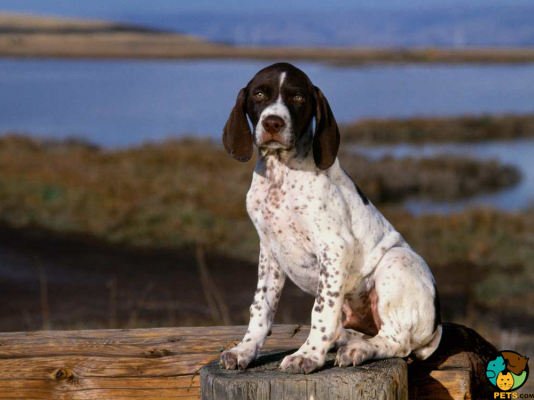 Today, the English Pointer is distinguished as one of the best bird-hunting dogs in the world. This dog breed was first recognised by the American Kennel Club in 1884, and later by the United Kennel Club in the early 1900s. The Pointer is a compact, agile and graceful gundog with a powerful staying power and speed. It should stand from 61 to 69 centimetres at the withers and weigh 45 to 75 pounds. Its body is well-proportioned showing balance and strength. English Pointers have noble heads carried in an elegant manner, a defined stop and dark-coloured eyes with an intelligent and alert expression. Its nose that sits atop its muzzle is wide and soft to the touch. Ears are set quite high and lie close to its head. English Pointers wear a short, smooth and shiny coat that is dense. It is easy to maintain and comes in a variety of colours including black, orange or lemon and liver, with white as its primary background colour. The coat sheds lightly throughout the year and will only require a weekly brush to keep it clean and matt-free. To maintain its shiny coat, occasional wipes of the chamois leather are also needed. Regularly check the dog's ears for any excess wax or signs of infection. Also part of dog grooming is making sure the teeth are brushed at least once or twice a week, and the nails are trimmed once a month. Do not forget to check for ticks and fleas or any sign of physical abnormalities, so you can quickly consult a veterinarian. Pointers are good-natured and friendly dogs which is why they are the popular choice for family pets. They are incredibly loyal, gentle and tolerant but are not a good candidate for a guard dog. They are very active and love nothing more than to run or play a game of chase. They are suitable for families with large back gardens, who can spare both time and energy to accommodate their activity requirement. Although they love the great outdoors, English Pointers also like to stay at home and chill with the family. However, they tend to suffer from separation anxiety and must not be left alone for extended periods of time. It's best if the family can have at least one member to stay at home and accompany the dog since they may become destructive. The Pointer is intelligent and a fast learner, but it can also quickly pick up bad habits. With this said, it is important that socialisation and training happen at an early age. Generally, Pointers are well behaved and gentle, especially around children but then again, any type of interaction must be well-supervised to keep things calm. Also, they along well with other dogs and even cats they grow up together with. However, Pointers are still hunting dogs which means care should be taken when there are small animals around. A typical serving for an adult English Pointer is 2 to 3 cups of high-quality dry dog food per day. When it comes to providing the best nutrition for your dog, nothing beats the advice of veterinarians or canine nutritionists. Remember that not all dogs have the same nutritional requirement. English Pointers need food that is high in animal protein for muscle growth and stamina. Just make sure to buy commercial dog food that is formulated for its size. Do not free feed to avoid bloat and stay away from food fillers that lack nutritional value such as wheat and corn. 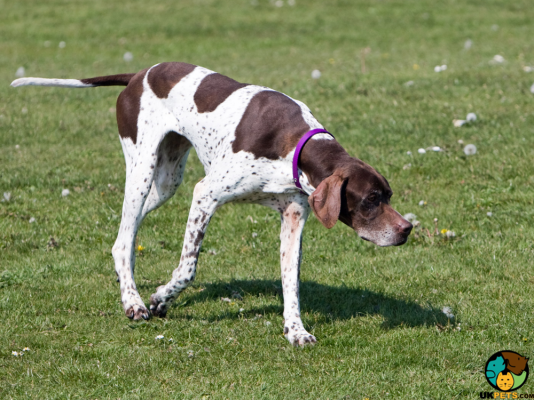 When Pointers are given the right care, they can live up to 14 years but like most dogs, if not all, they are also predisposed to a few health disorders that may include Hip Dysplasia, Progressive Retinal Atrophy, Epilepsy, Neurotropic Osteopathy, Allergies, Cherry Eye, Entropion, Cataracts, Chondrodysplasia, Addison's Disease, Demodectic Mange and Skin Cysts. Do not hesitate to consult your vet when you notice anything not normal with your dog. English Pointers are gundogs and as such are active dogs that will require plenty of physical and mental activities. At least 2 hours of daily exercise will suffice to make them happy and healthy. They will also love to accompany you on a run or a hike to help them relieve stress and shake off the boredom. Dogs are great additions to your family but is it great when it comes to your finances? Let's get real, owning a dog is not cheap and caring for it will take years. Being unprepared to be a dog parent budget-wise may spell trouble ahead, so let us settle this once and for all, "how much does it cost to buy a dog?" Well, cost varies depending on the type of dog and other factors. When you buy an English Pointer, you may need to spend no lower than £700 for a well-bred pup. Buying a puppy is only the beginning since it requires money to raise it. What does raising a dog entail? It means buying your English Pointer dog food thath costs around £40 to £50 a month. Pet insurance is another cost you may want to consider despite it being optional. However, pet insurance will help you with future expenses during emergencies so think twice before crossing that out on the list of costs. Veterinary care is a significant expense that will put your mind at ease but your pocket empty if you are not prepared. Veterinary costs that may not go lower than £1,000 a year include regular check-ups, initial vaccinations, boosters and neutering/spaying when the time comes. 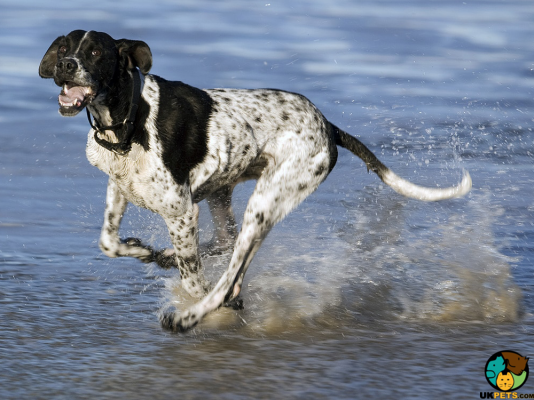 Overall, you will spend roughly around £70 to £110 to raise and care for an English Pointer. Is a Pointer Right for You? 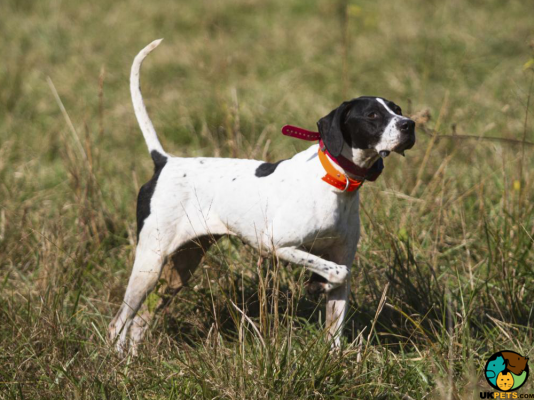 The English Pointer is a sweet-natured and noble gundog. It is highly energetic and is suitable for an active owner. It is a wonderful companion and family pet that is easy-going and calm. It is super friendly and should not have the role of a guard dog.